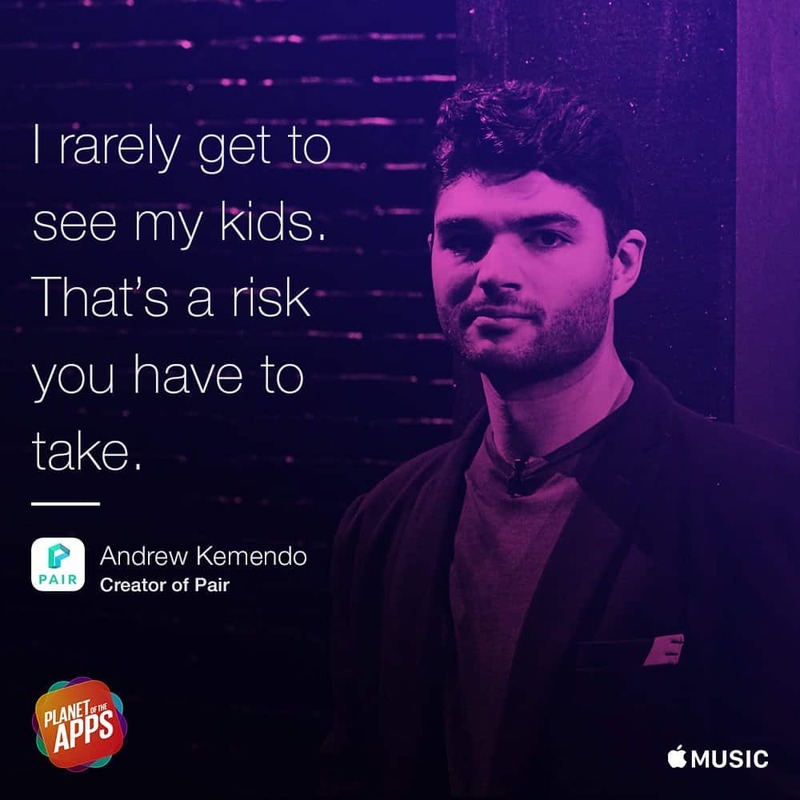 Last year, Apple Music launched a new show called Planet of the Apps. It was like American Idol, but for software developers. Entrepreneurs had 60 seconds to pitch their app idea to celebrity judges in the hope of winning startup funding. Seeing this, Tech Twitter erupted. Basecamp’s Jason Fried called out Apple for promoting such a tone-deaf ad. He was upset that such an influential company would promote unhealthy behavior. 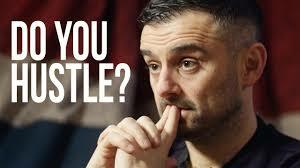 But what most people didn’t notice was that one of the show’s judges was the King of Hustle himself, Gary Vaynerchuk. Vaynerchuk, CEO of Vayermedia, has helped popularize the term, hustle, through his books, talks, and frequent videos. But what does “hustle” mean? The answer depends on who you ask. Some call it the ability to overcome rejection, knowing how to get noticed, and sustaining a strong work ethic. But others believe that it’s another word for “extreme workaholism.” It doesn’t help that Vaynerchuk has admitted to working 18 hours a day. and celebrates it in brief Facebook and Snapchat videos. Is hustle and workaholism the only way to succeed? The highlighting and celebration of this behavior has caused managers and workers alike to think if they don’t push themselves to the edge, they’ve failed to do their best. “Most entrepreneurs can’t spend a second on social media without being hit in the face by a ‘hustle-mode’ type post, tweet, Instagram picture, quote or livestream. Don’t get me wrong, you have to work hard, but “hustle-mode” can be a quicksand if you’re not careful. What I mean is with “hustle” you’re basing your business on luck, instead of proven systems for success. And yes, you will get “more lucky” by working harder, but you can only work so hard before getting burnt out. “‘Hustling’ doesn’t mean waking up at the crack of dawn and exhausting yourself until you collapse. The truth is, it’s not about how much you sleep or don’t sleep. It’s what you do while you’re awake that matters. Even the king of hustle understands there is nuance to the workaholic, hustle culture, but many miss that in the sound bytes and posters promoting it. Today, we cut through the noise and help you understand both why you should embrace work-life balance and how to to make it work. Over-work is a symptom of a bigger problem that goes well beyond any sound bytes from Gary V. Many jobs expect you to over-extend yourself or you’ll be guilted for seeking work-life balance. 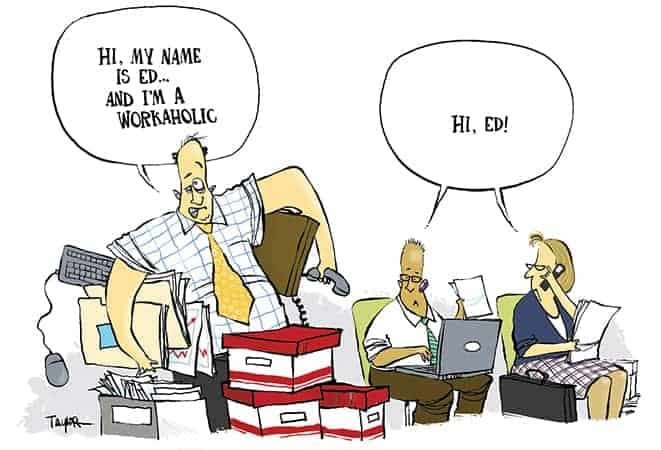 Often, managers are the ones pushing this attitude; under pressure to deliver numbers and set an example for your team, you get sucked into the workaholic hustle. Then, just like the average employee, you’re suffering, too. You’ve sacrificed your personal life and your team’s for the hope of delivering for your company. But this effort, can be counterproductive. When you and your employees sacrifice too much time and energy, you’ve most likely decreased your productivity and output. The quality of the hours you work beats brute forcing a larger quantity. Here’s why you and your employees should reconsider the workaholic, hustle mindset, and how you can embrace a better work-life balance. Today, being overworked and over-sacrificing is often seen as a virtue, instead of a problem. Some places push their staff so hard that if you do not dedicate your life to your job, you’re not considered a team player. 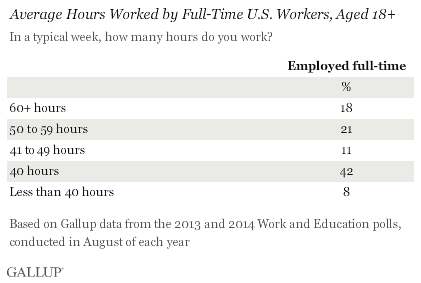 According to Gallup, the average American full-time employee works 47 hours a week, and nearly 1-in-5 (18%) are working more than 60 hours. However, Gallup didn’t include time spent on your phone, which turns out to be more than you may expect. Pew Research revealed that 35% of employees believe that internet, email, and cell phones have increased their workload. Most people are working long hours, and performing tasks on-site as well as virtually. This schedule prevents them from truly unplugging from work, resulting in long-term risks of burnout, and overall suffering of performance due to fatigue. Feeling productive isn’t the same as being productive. Just because you spend a lot of time working doesn’t mean you’re producing great work. The more hours you work, the more work you produce, right? Not really. In his article, The Productivity of Working Hours, Stanford University’s John Pencavel explained that productivity tends to decrease when you work too much over an extended period of time. He studied World War I data from the British Health of Munition Workers Committee (HMWC). During the war, Britain needed to increase worker productivity due to the high demand for weapons and ammunition. After an investigation, HMWC actually advised military factories to cut their workers’ hours and provide at least one day off. Pencavel discovered that when employees worked below 49 hours a week, their output corresponded with their time. But, if they worked over 50 hours, their production started to decrease. As you can see in the chart above, after a certain point, worker output plateaus; working 70 hours was just as productive as working 56 hours. Unfortunately, those who had a 70 hour per week schedule were wasting 14 hours of their time. Even more telling, workers who had a day off were more productive than those who had none. 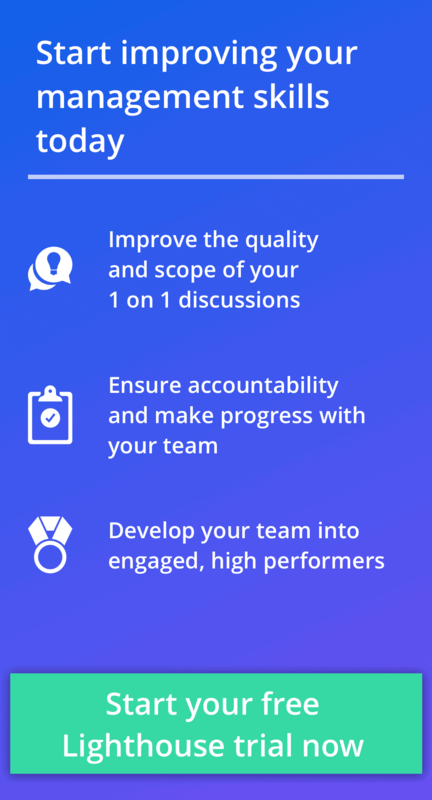 Are you driving your team too hard? Asking your workers to work longer hours won’t always help your company. Besides a drop in productivity, working long hours has long-term financial consequences like high absenteeism, turnover, and health insurance costs. According to the report, Mind the Workplace, chronic stress costs employers $500 billion in lost productivity a year. 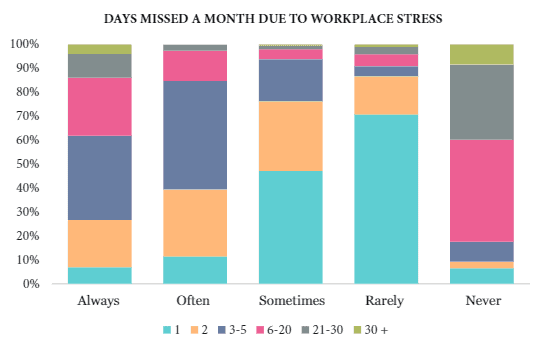 This is because stressed employees tend to miss more work. Thirty-five percent of those who missed work said that they took 3-5 days off a month. Another 38% missed six days or more. Fourteen percent missed 21-30 days! Also, these burned-out employees had managers that weren’t helping. Most of the employees felt unsupported in the workplace. This then led to ~65% of employees being distracted for 30+ hours a week because their co-workers were also stressed and frustrated. These employees leaving work are the result of being overworked in an environment that doesn’t appreciate them. However, the goods news is that this trend can be reversed with the help of a thoughtful and caring manager. If your actions and words demonstrate to your employees that their work-life balance matters, their engagement and morale will increase. Many companies believe that the well-being of their employees doesn’t matter. This leads to their choosing to ignore any issues with work-life balance. But, this decision could be costing them thousands, or even millions. When managers prioritize the personal welfare of their workers, they tend to gain a significant return on their investment. Here are a few companies that have benefited from investing in their employee’s work-life balance. 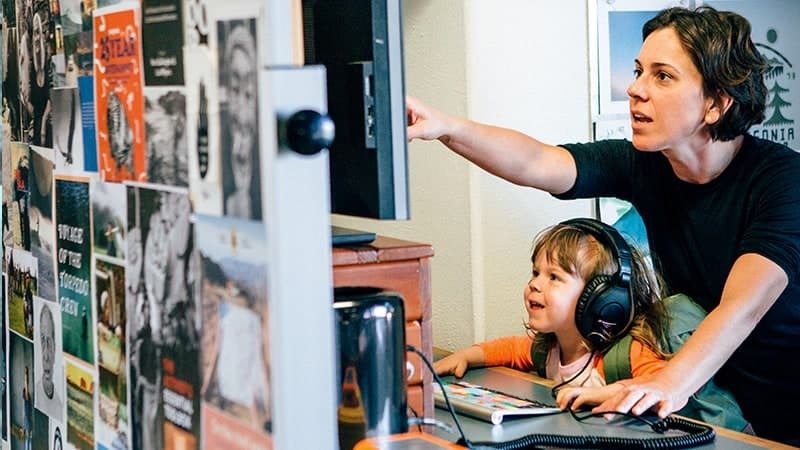 In the May 1997 Issue of Working Mother, Hewlett-Packard (HP)’s Financial Services located in Colorado Springs, discovered a way to increase their employees’ productivity. One day, a group of workers asked their managers if they could work four 10 hour work days instead of five 8 hour days. They argued that this plan would help relieve the workers’ stress and boost workplace morale. Thus, improving their customer service. The managers agreed. They set up an experiment with 63 out of 100 of workers trying the four day week. The results? Their productivity almost doubled! The test group completed 63 transactions a day, while the control group (those with the regular five work days) only completed 37 transactions. Not only did this experiment increase productivity, but it also cut the overtime hours in half. This went straight to HP’s bottom line, leading to a savings of 50% in their budget. Best of all, it gave HP a new way to attract potential new hires. This is an example of why you should listen to your employees. Giving them more hours or days of rest could have a big impact on your business’s overall performance, and an experiment can be the perfect way to see what works in your situation. In the 1990’s article, the Long-Term Impact of Johnson & Johnson’s Health & Wellness Program, researchers calculated the financial benefits of the company opening wellness programs in 30 locations. The program’s goal was to offer health, wellness, disability, and medical services to Johnson & Johnson employees. Researchers followed 18,331 employees for five years to understand how they used the program. After the 3rd and 4th year, the company saved $8.5 million a year due to lower health care costs. That’s $225 per worker. These numbers are the result of workers using the wellness program before they were sick enough to go to a hospital. The article reported reductions per person in hospital inpatient use ($119.67), mental health visits ($70.69), and outpatient service use ($45.17). The company only had an increase in emergency department use ($10.87 per person). Johnson & Johnson benefited greatly by providing health resources to their workers. When they stopped illnesses before they began, they saved millions in long-term healthcare costs. This came from understanding that providing the work-life balance that makes it safe and okay to see a doctor early pays off in the long term. Do you make it safe for your employees to practice healthy habits, and take the time necessary to seek preventative care? She claimed that since its creation, the program has regained 50% of its cost due to tax benefits. “The federal government recognizes the value of on-site child care… and grants a qualified child-care program a yearly tax credit of $150,000. In addition, the government allows a company to deduct 35% of its unrecovered costs from its corporate tax bite. However, that’s not the only benefit Patagonia experienced. Their turnover costs (which includes recruiting, relocating, and training an employee) has also decreased by 30%. “In the United States, 20%–35% of working mothers who give birth never return to their previous job. And the icing on the cake? They also found their employee engagement increased by 11%, which we know from past Gallup studies is worth millions of dollars to a company of Patagonia’s size. With all these benefits, Marcario concluded that they could prove they recovered nearly 91% of the cost of creating and maintaining the child-care program each year. Given that half of Patagonia’s employees are women, Marcario found a high upside opportunity to better engage and retain their staff by investing in their work-life balance. Our bodies don’t have enough fuel to keep us at our best performance 24 hours a day, 7 days a week. We need breaks. We need to refresh. That’s why you should develop a healthy balance between stress and rest. Although stress can be painful, if managed wisely it can be very beneficial. 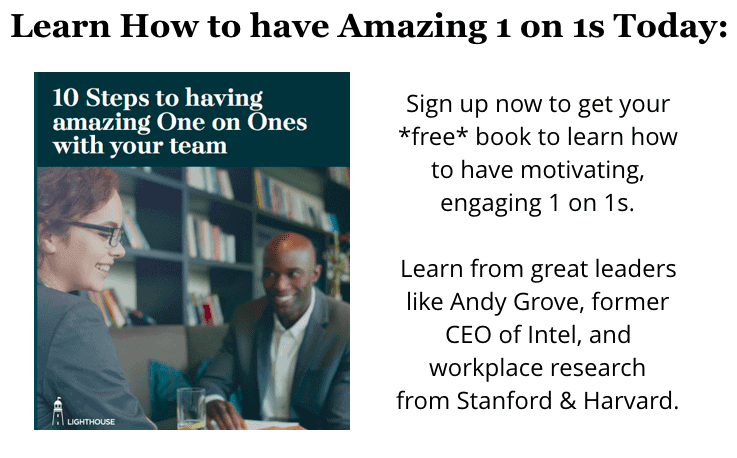 As we covered with our article on high performing teams, stress can help you learn and grow. When you’re stressed, your brain and body are being pushed to their limit. In response, your cells reproduce to keep up with the challenge. This causes you to develop new muscles and cells that are better than before. However, if you’re under too much stress without taking a break, your brain and body will start to fail. Your cells won’t have enough energy or time to repair themselves, so you’ll start to break down. Unfortunately, this is exactly the situation in workplaces that create chronic, unyielding stress for their employees. 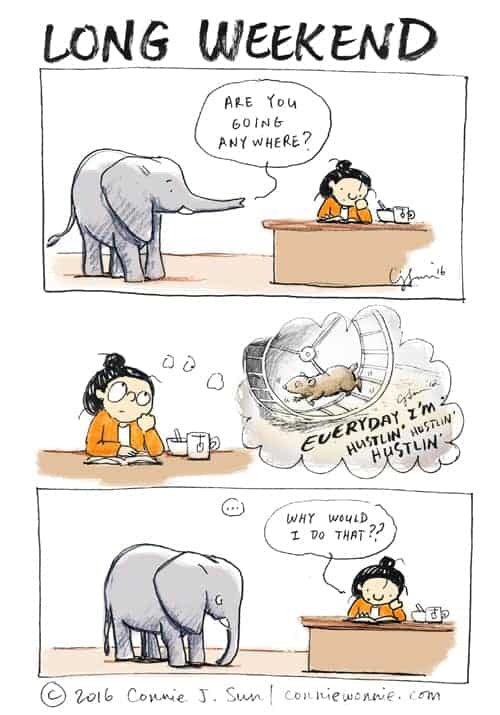 In the book, Peak Performance by Brad Stulberg and Steve Magness, the authors recommend that every long period of stress should be followed by a period of rest. 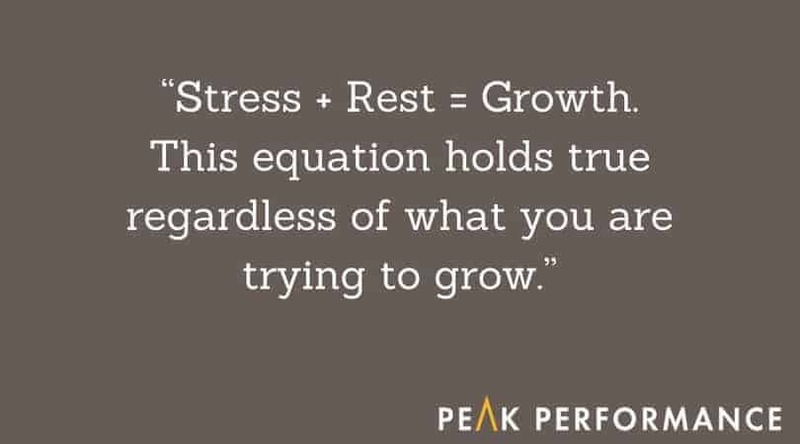 Under rest, your body starts to recover and adapt, allowing you to push harder in the future. Managers and employees alike, should make time to rest. Athletes like Lebron James and Tom Brady are often under intense pressure, so they spend millions of dollars on self-care to extend their careers. We’re not that different. Rest is something you should invest in every day. Add short breaks throughout your day. Take a walk, go get a coffee, or catch up quick with a work friend. Then, after long stretches of stress for a big project or deadline, schedule long-weekends or vacation days. The longer you push, the more rest you need. Whenever you feel exhausted, recognize it. A little rest now will prevent burnout later. Remember: an overworked employee isn’t a productive employee, whether it’s you or a team member. To create a better work-life balance, create a cycle of stress. Doing so will allow your body to adapt to changes and prevent long-term exhaustion. One way to do this is to try the Pomodoro technique. It breaks your day up into 25 minute intervals of intense focus on a task at work, followed by 5 minutes of rest. However, 25 minutes is not a hard and fast rule; you can follow your ultradian rhythm by working up to 90 minutes with 20 minute break. Proving the value of this work-break-work-break approach, the time-tracking app, Desk Time, partnered with their parent-company, Draugiem Group, to find out how the top 10% of employees spent their time. 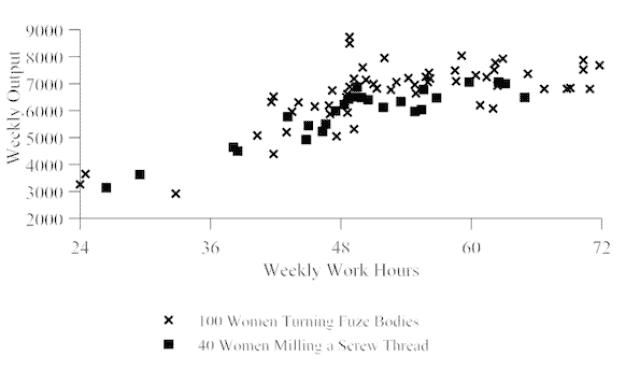 They discovered that the most productive workers weren’t working 8 hours straight every day. Instead, they were working in cycles of approximately 52 minutes of work, and then a 17 minute break. This rhythm of stress and rest allowed them to accomplish more work than if they were pushing themselves to work straight through the day without breaks. Does this mean you should work for exactly 52 minutes then a 17 minute break? No. Instead, develop your own work cycle that works for you. 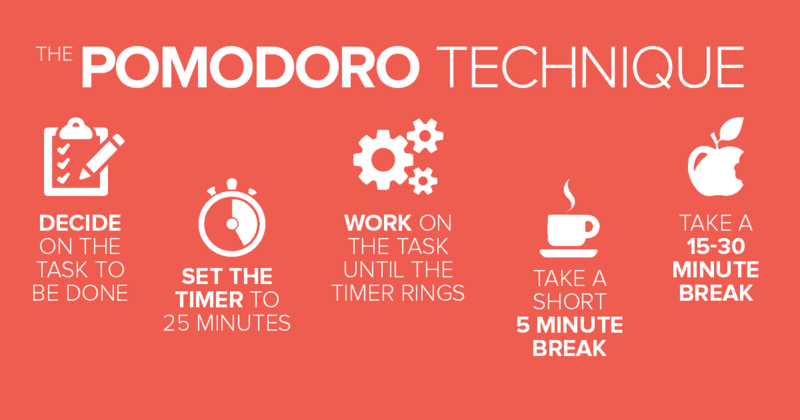 To help, try one of the many free Pomodoro tools that you can download and adjust the work and break lengths for to see what fits you. Intentional breaks matter at both the daily and annual scale. For longer periods of intense work, consider scheduling mini-vacations or self-care sessions during your time off. This idea is from Time Coach Elizabeth Grace Saunders. She writes in HBR that professionals should see their time more as an investment. Saunder’s philosophy is that your time is an investment that decreases in value whenever it’s wasted on unnecessary or counterproductive tasks. She recommends that every other week you spend 1-3 days dedicated to having fun. Taking time to have mini-vacations local to you can really help you relax while managing your budget. By leaving on Friday and coming back on Sunday, you can separate yourself fully physically and mentally from your work. On Monday, you’ll then come back recharged and ready to do your best work again. If you can’t take weekend trips, then look for ways to relax after work. Go out with friends, exercise, or watch a movie with your friends or family. You can also get creative with finding ways to recharge. For example, consider asking your employer if you can work remotely occasionally. This can help you avoid the stress of a long commute, and better control your cycle of stress without office distractions. Whatever break you choose, make it a habit. That’s how you ensure you work sustainably and create a healthy work-life balance that brings out your best. When you spend too much time at work, you start to decrease your productivity. There are only so many hours you can be at your best before your body starts to power down. 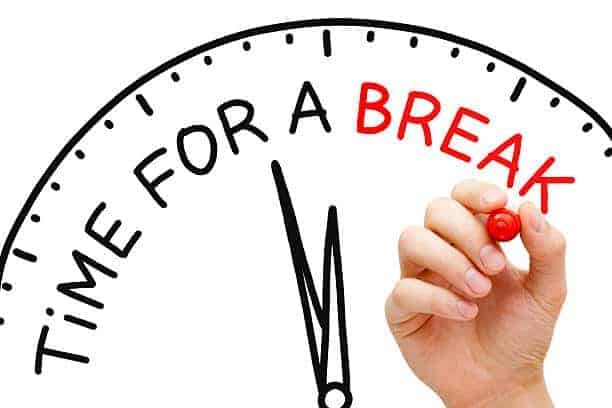 Remember to take breaks. You need them so your body can recover and adapt. You can maintain your best performance at work by taking a short period of rest after intense periods of focus and hard work. And after big pushes, consider longer breaks, like a weekend getaway or full vacation to recharge. As a manager, consider offering the same advice to your employees. Encourage them to take breaks, work flexible hours, and perform an optimal amount of quality work over an exhausting high quantity of work. When your employees have enough time to have a personal life and recharge, they’ll return to work more engaged and productive. Work-life balance may be a foreign concept at many workplaces, but smart companies and leaders embrace the potential for better results by encouraging it. 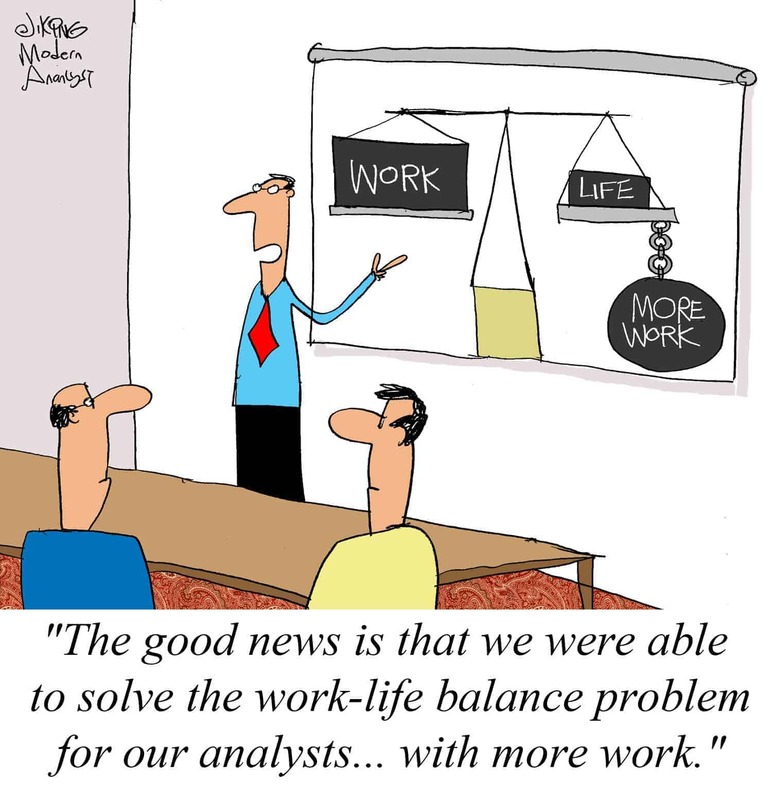 What tactics do you use to have a healthy work-life balance?